Bullis Charter School fourth-grader Aidan Free introduces Chelsea Clinton to classmates. Fourth-graders at Bullis Charter School had the opportunity to Skype with author, activist and former first daughter Chelsea Clinton Nov. 16. Fourth-grader Aidan Free was looking for ways to support victims of hurricanes Harvey and Irma, so he gave a speech about fundraising at a school assembly and researched disaster relief with his family. Through the Red Cross Disaster Relief Fund, they discovered that Clinton was willing to donate a 30-minute Skype call and a personalized copy of her book She Persisted to the winning bidder. Aidan committed all of his saved allowance, and when the winning bid exceeded that, his parents donated the difference. 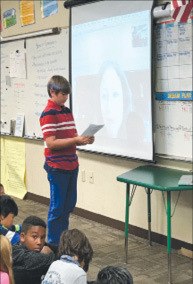 He invited his classmates to participate in the Skype session, and fourth-grade teachers Jeri Chi and Emily Drake seized the opportunity to prepare their students. Students prepared 12 questions on a variety of topics, which led to a discussion with Clinton about her work in global health, her life as a teenager in the White House, whether she plans to run for office and her proudest achievement – motherhood.